Pictured above: Members of the Pickerington Lions Club stand with District officials at the District OH7 Convention after receiving awards. 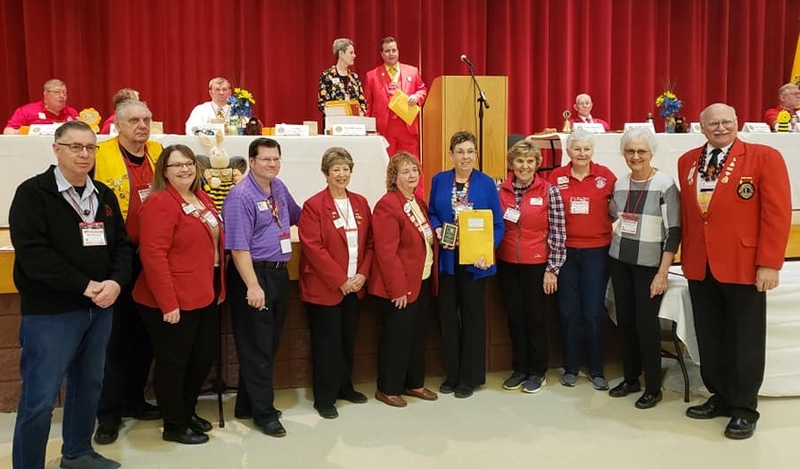 March 2019: For the second year in a row, the Pickerington Lions Club was named Best Club at their recent District Convention for clubs in the 31-50 member category. The Pickerington club was represented at the March 8-10 convention by members Debbie & Bob Hulvey, Brian & Lilane Fox, Bob Mauger, Carol Yurt, Dorothy Kavanaugh, Sonnie Stewart and George Bachman. The Pickerington Lions also received many other awards during the event, including the coveted District Humanitarian Award and District Service Award. Additionally, club president Debbie Hulvey, secretary Bob Mauger and Treasurer Lilane Fox were honored by receiving the Excellent President Award, the Excellent Secretary Award and the Excellent Treasurer Award, respectively. 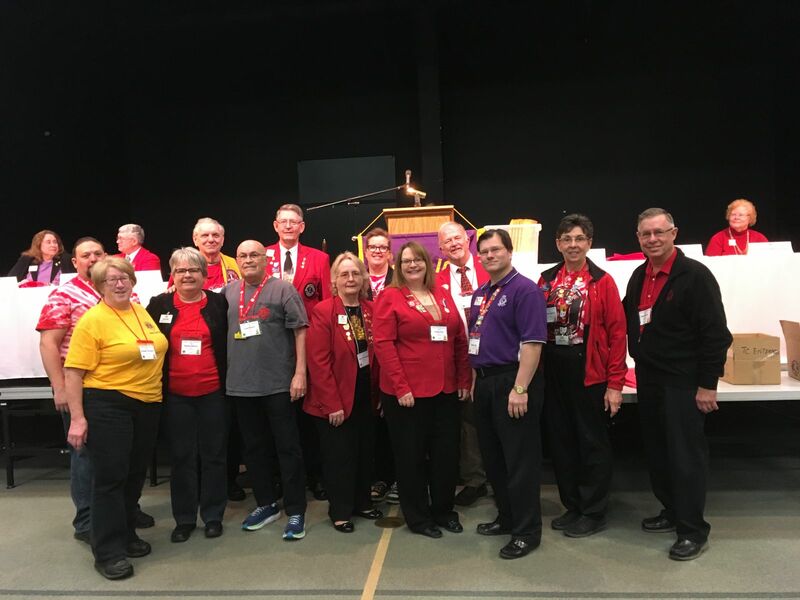 March 2018: The Pickerington Lions Club received a tremendous amount of recognition at the recent District OH7 Convention in Lancaster, Ohio, March 2-4. The Lions won BEST CLUB honors in the 31-50 member category for its many service projects over the last year. The club also won the coveted District Humanitarian Award as well as the District Service Award. Individual recognition was awarded to Lions Susan Howey (Excellent President Award), Lon Howey (Excellent Treasurer Award), Bob Mauger (Excellent Secretary Award) and Brian & Lilane Fox (Council of Governors Award). Members of the Pickerington Leo Club was also involved in the convention, taking part in team-building exercises and leadership training. They also raised money during the weekend for their charitable donations. Congratulations, Pickerington Lions, for donating $11,000 to charity in this Lions Year! January 13, 2018: The Pickerington Lions Club has made donations to the community, charitable organizations and others totalling approximately $11,000 so far in this Lions Year which began on July 1 of 2017. Vision & Diabetes Research and many others! The Pickerington Lions Club was founded in 1946 to give service to the community and to help those in need. We believe that we have done just that this year! 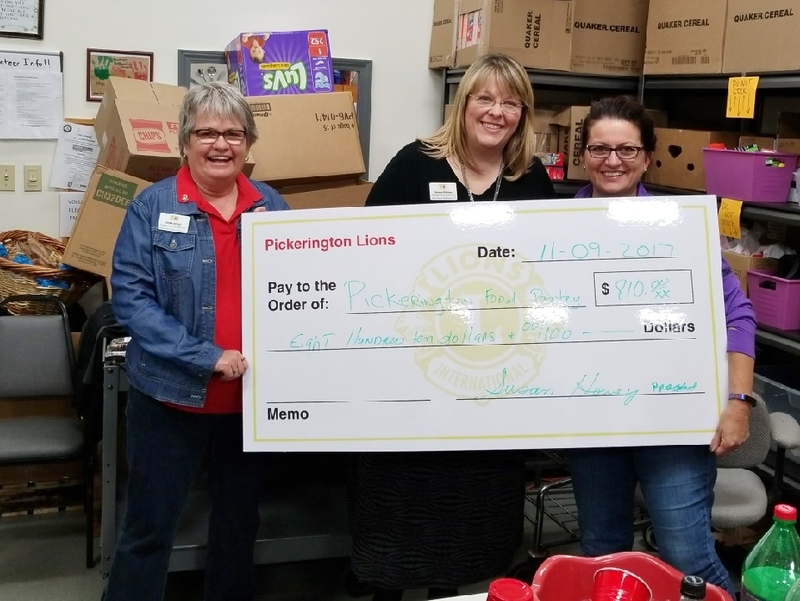 November 9, 2017: The Pickerington Lions Club made an $810 donation to the Pickerington Food Pantry on November 9. Because the Pantry can purchase food from the Mid-Ohio Food bank at a rate of $10 to $1, the donation could purchase over $8,000 worth of food for the needy. Below, Lions President Susan Howey presents check to Lion Vanessa Niekamp, director of Community Outreach for the Pantry, and Gessica Peraza, the pantry's director of operations. 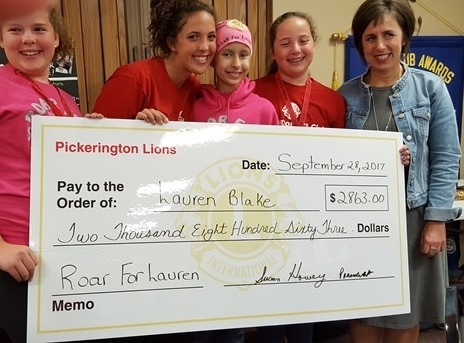 SEPTEMBER 30, 2017: The Pickerington Lions Club and Leo Club worked together raise money over the last few months for Lauren Blake, a Pickerington girl with a form of brain cancer. The two clubs sold wrist bands that said "Roar for Lauren", we raffled off two OSU tickets and took donations. At the Lions' September 28 meeting, a large contingent of Lions and Leos were on hand as we presented Lauren and her Mom with a check for $2,863. This money will go to help pay the many bills that are not covered by insurance. We are still selling wristbands and taking donations. If anyone would like to donate, you may make out a check to Pickerington Lions Charities (put "donation to Lauren" in memo line) and mail it to PO Box 163, Pickerington, Ohio 43147. Pickerington Lions Charities is a 501(c)(3). Donations are tax-deductible. As you may know, the Volunteers of America organization lost their entire inventory of goods in a warehouse fire a few days ago -- a loss of at least $450,000. In conjunction with VOA, the Pickerington Lions Club is organizing a Community-wide Collection Drive on Saturday, January 28 from 9 a.m to 1 p.m. to help replace those items. The Drive will be held at Dwayne R Spence Funeral Home on Hill Road in Pickerington. All gently used items will be accepted including clothing, bedding, tools, kitchen items, toys. A VOA truck will be present to collect the items and to transport larger items to their temporary storage areas. We are asking all Pickerington residents to look thru their closets, basements, attics, and other storage areas for items that can be donated to VOA on the 28th. Above: Lions President Vanessa Niekamp welcomes everyone to the 70th Anniversary celebration of the Lions. The Pickerington Lions Club celebrated its 70th anniversary at the Pickerington Senior Center on October 8. The event began at 7 PM featuring a great dinner of salad, Chicken Marsala, ham, roasted red potatoes, cheesy broccoli, vegetables and birthday cake. The guest speaker was Past District Governor Bill Schultz of Athens who gave an inspirational talk about Pickerington's 70th anniversary and Lions International's 100th anniversary. Also in attendance was Lee Gray, Mayor of Pickerington, who presented the Lions with a mayoral proclamation congratulating the Lions on 70 years. Fifty Lions from around District OH7 attended. All guests received a Lions bumper sticker as a welcome gift. One of the highlights of the evening was the presentation of the Distinguished Service Award to longtime Lions members Herb & Jeannie Sharp. A very well-deserved award. Above: Vanessa Niekamp presents Jeannie & Herb Sharp with the Distinguished Service Award. The Pickerington Lions Club will celebrate its 70th anniversary at the Pickerington Senior Center on October 8. The event begins at 7 PM with with a festive dinner followed by a program of fellowship and awards. The guest speaker will be Past District Governor Bill Schultz who will speak on the 100th anniversary of Lions International. The Mayor of Pickerington, Lee Gray, who is also a member of the Lions, is expected to present a Mayoral Proclamation to the club during the evening. One of the highlights of the evening will be the presentation of the Distinguished Service Award to long-time members Herb & Jeannie Sharp. 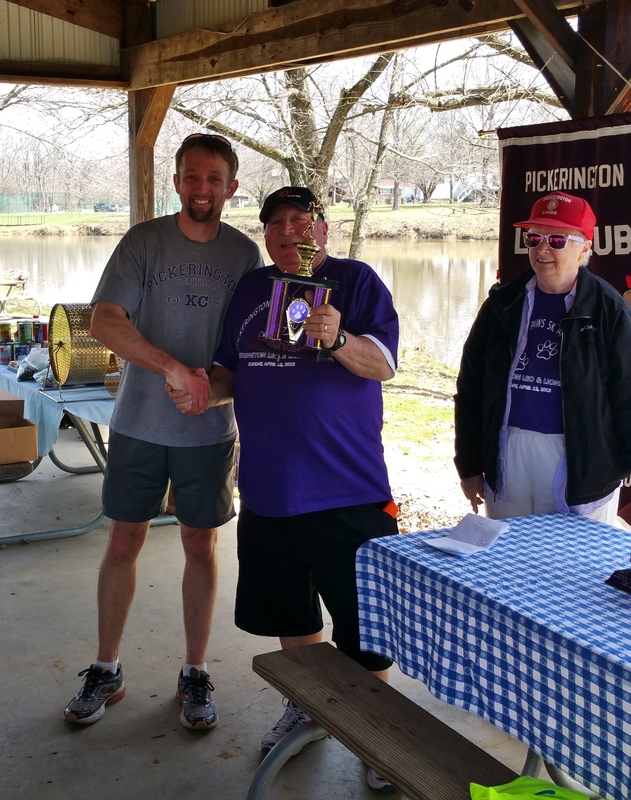 April 2016: The Pickerington Lions and Leos Clubs ran their Second Annual Pickerington PAWS 5K on April 10. Although it was cold, about 45 runners participated in the 5K and 1-mile run. The event was sponsored by Spence Funeral Home, Capitol Fence and La Fogata Grille. All proceeds go to Pilot Dogs for the Blind. March 2016: The Pickerington Lions Club received a tremendous amount of recognition at the recent District 13K Convention in Newark, Ohio, March 4-6. The Lions won BEST CLUB honors in the 36-50 member category for its many service projects over the last year. The club also won the coveted District Humanitarian Award as well as the District Service Award. Individual recognition was awarded to Lions Bob & Jean Mauger (Zone 4 Lions of the Year), Lon Howey (Excellent Treasurer Award), Bob Mauger (Excellent Secretary Award) and Brian Fox (Council of Governors Award). The Pickerington Leo Club was also named BEST CLUB in the small community-based club category (50 or fewer members). 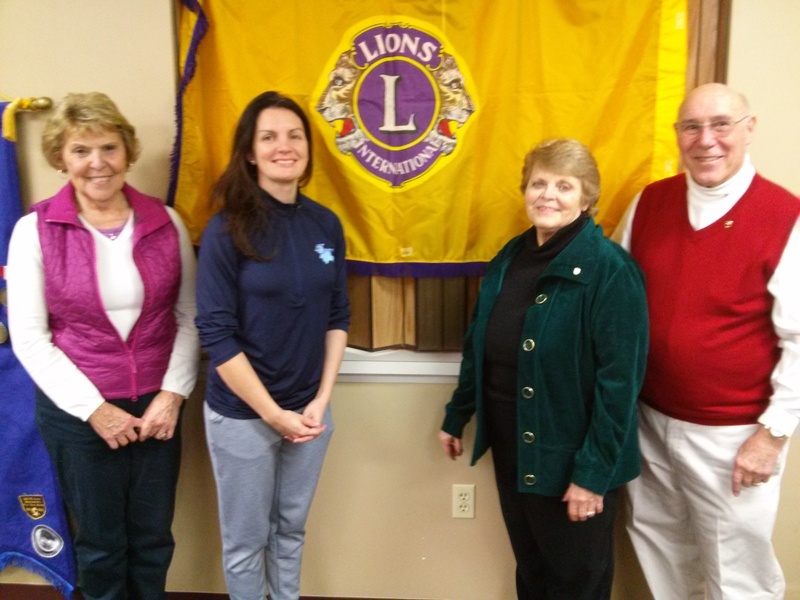 January 2016: The Pickerington Lions inducted four new members at its January 14th meeting. The inductees pictured above are: Carol Yurt, Avery Gustovich, Jackie & Joe Self. Welcome! November 2015: The Pickerington Lions adopted two families from Fairfield County Jobs & Family Services for Thanksgiving and collected a total of 144 food items for their Thanksgiving meal (and beyond). We also donated to each family a $50 Gift card to a local super market for their use. Thank you, Lion Pat Deskins, for chairing this worthy project again. 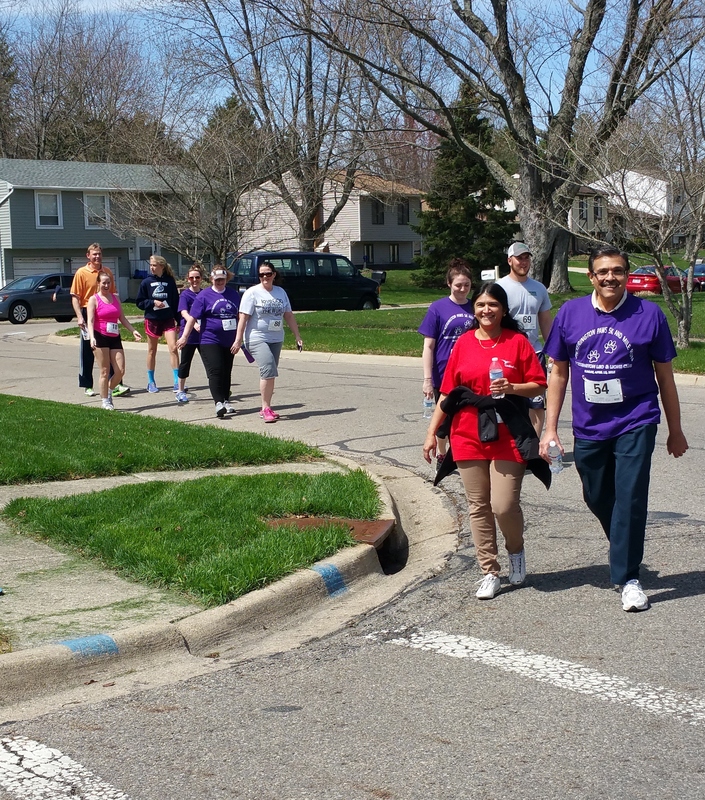 Pickerington PAW 5K was a Big Success! 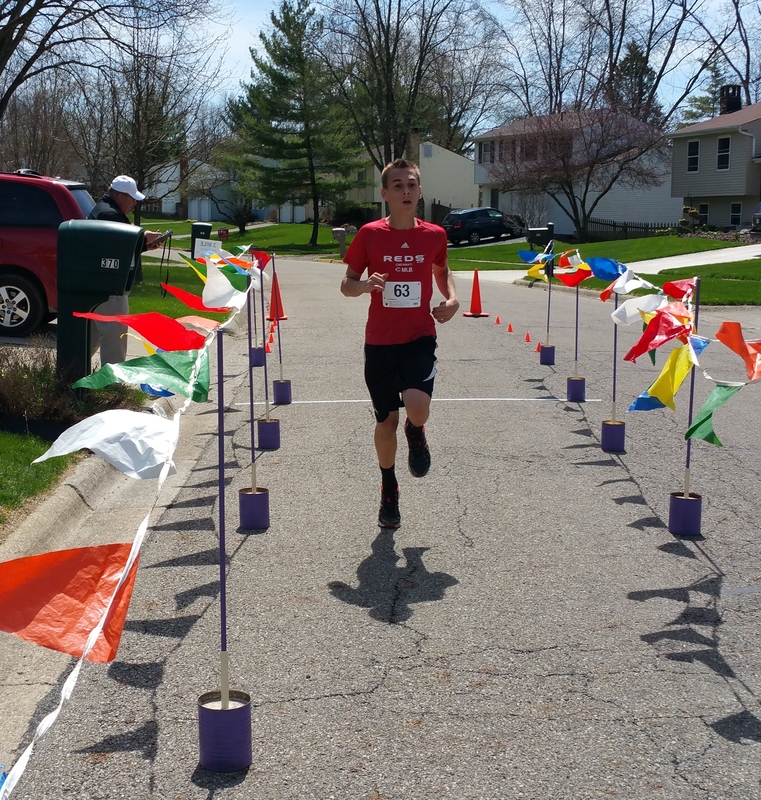 The Pickerington Leo and Lions Clubs worked together to put on a brand new 5K race in Pickerington on April 12. 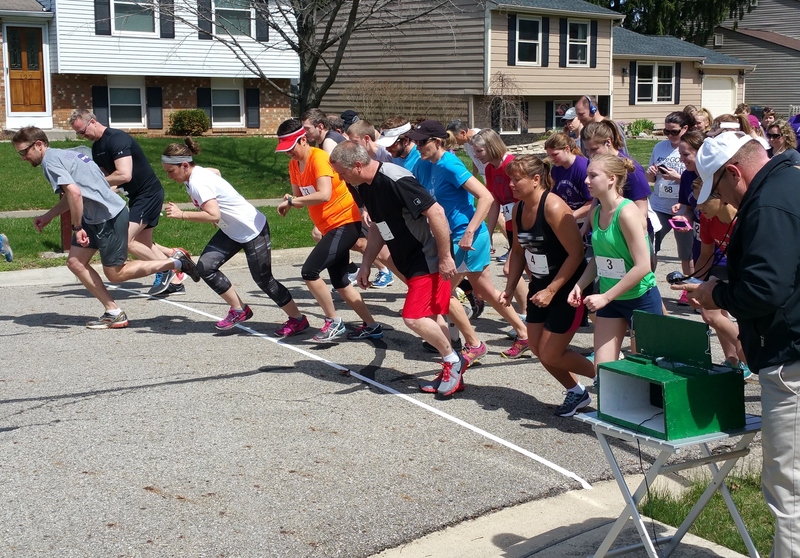 Called the Pickerington PAWS 5K, the race raised money for the Ohio Lions Pilot Dogs. 88 runners took part in this first annual event. Thanks to all the Lions and Leos who participated by working or running in the race. Thanks also to our sponsors: Capitol Fence, La Fogata Grill, Omezzo's Italian Restaurant, Spence Funeral Home and Giant Eagle. Andy Fischer, winner of the 5K, is presented with the 1st place trophy by Lions Bob & Cherie Koch. This was a great family event! The Pickerington Leo and Lions Clubs are working together to put on a brand new 5K race in Pickerington. Pickerington Paws 5K will be run on April 12 in the Ra-Mar and Pickerington Hills subdivisions. Both a 5K and 1-Mile race will be run. Entry fee for participants is only $15. ALL PROCEEDS WILL BE DONATED TO PILOT DOGS for the training of dogs for the blind. COURSE: Both the 5K and 1-mile run will start and end at Ramar and Morningview Ave. REGISTRATION: By mail from February 13, 2015 through April 1, 2015 at Pickerington Lions Club, P.O. Box 163, Pickerington Ohio 43147 (Make checks payable to Pickerington Lions Charities). ENTRY FEE: $15 (Non-refundable). Everyone who registers by April 1, 2015, will receive a FREE T-shirt. We adopted two families from Fairfield Co. Jobs & Family Services for Thanksgiving and collected a total of 295 food items for their Thanksgiving meal (and beyond). We also donated to each family a $50 Gift card to a local super market for their use. Thank you, Lion Pat Deskins, for chairing this worthy project again. 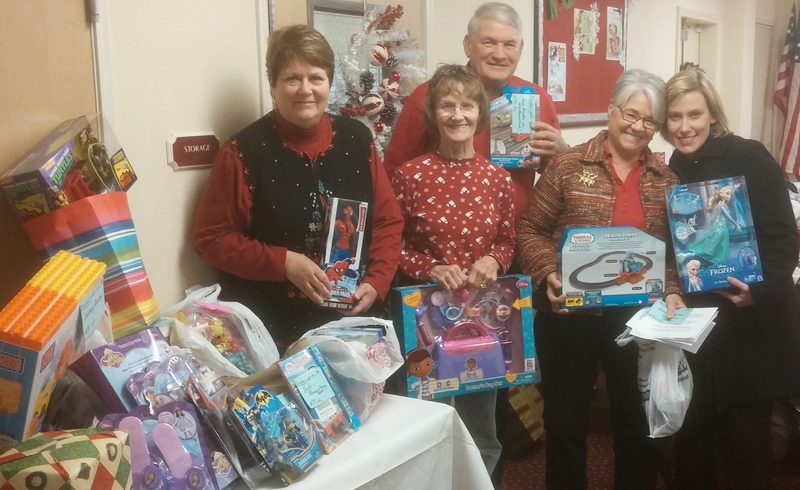 Once again our Lions Club “adopted” some Fairfield County kids in need, helping to provide them a Merry Christmas and some financial relief for their families. Thank you, Lions Ken & Susan Badertscher, who chaired our effort this year. They estimate that our gifts came up to a value of at least $1,250. The club also chipped in an extra $500 in gift cards. Lion Brian Fox and Leo Tommy Fox distributed 24 beautiful poinsettias to Echo Manor, Pickerington Nursing & Rehab, Pickfair Square Senior Apartments and Amber Park on December 6. On December 6, Lions helped out at the Pickerington Senior Center’s annual "Breakfast with Santa" event by wrapping presents at the Secret Santa Shop. Helpers included: Lions Bob & Jean Mauger, Jim & Bernie Hatem, Judith Barber and Jo Ann Seaman. 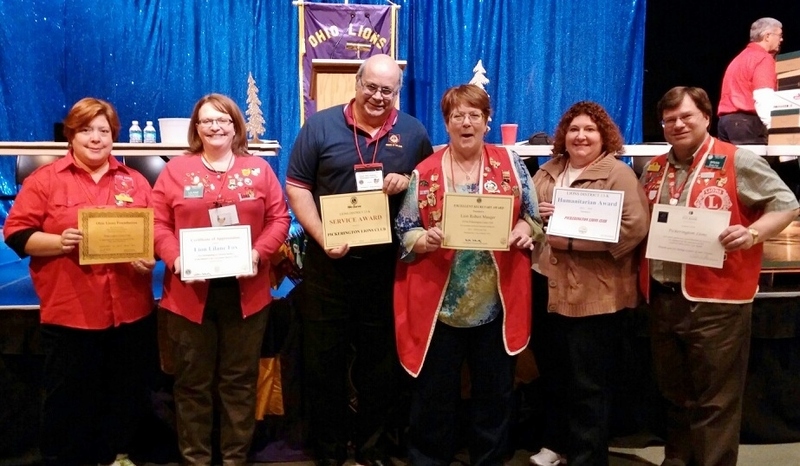 March 3, 2014: The Pickerington Lions Club received several awards at the District 13K Convention on March 1-2, including the District Humanitarian Award and the District Service Award. The Humanitarian Award is based upon the club's donations over the past year totaling over $8,000 to many needy individuals and charitable organizations. The Service Award is based upon the many service project performed by the club. Additionally, the club's president Jeff Seaman, Secretary Bob Mauger and Treasurer Larry Twyman received the Excellent President, Excellent Secretary and Excellent Treasurer Awards, respectively. Club members Brian and Lilane Fox also received the International President's Certificate of Appreciation. Pictured with some of the awards are: Lions Club members Jo Ann Seaman, Lilane Fox, Jim & Bernie Hatem, Rebecca Smith and Brian Fox. 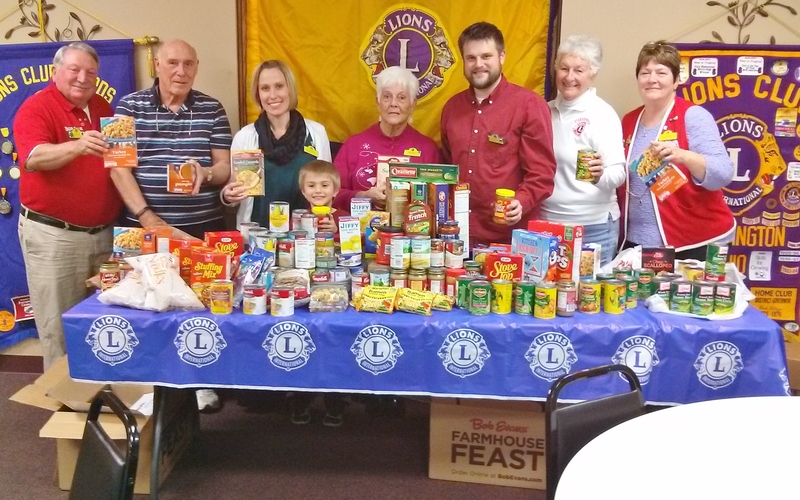 November 15, 2013: The Pickerington Lions Club recently collected over 305 food items in order to create 2 large food baskets for two needy families at Thanksgiving. The families were "adopted" from Fairfield County Jobs and Family Services. Each basket contained a variety of canned, boxed and non-perishable food items for a complete Thanksgiving meal as well as other meals. The club also supplied each basket with a $50 gift card. 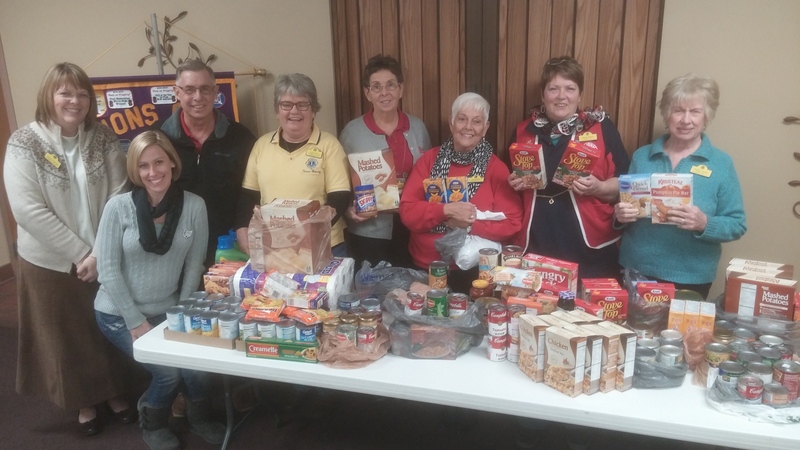 Pictured with some of the food are: Lions Club president Jeff Seaman and members Carolyn Jones, Vanessa Niekamp, Lana Houston, Brian Fox and Pat Deskins. 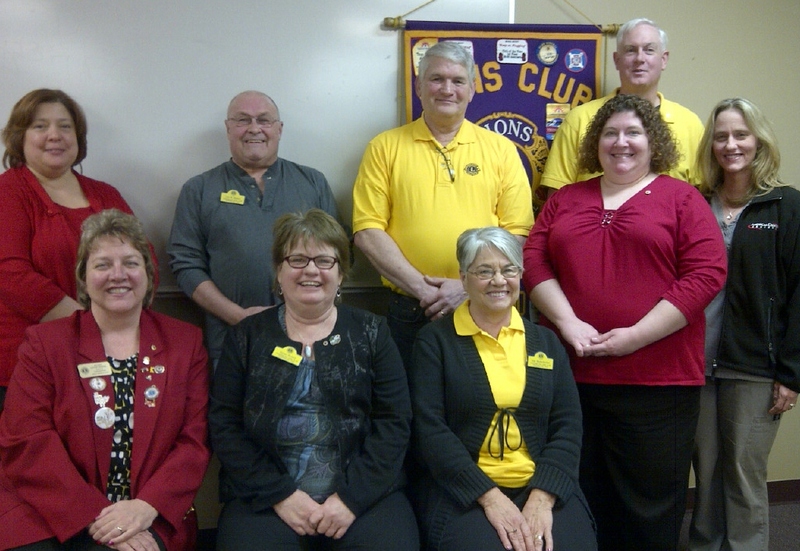 January 28, 2013: The Pickerington Lions Club inducted six new members at its January 24th meeting. The inductees were: Lon & Sue Howey, Ken & Sue Badertscher, Rebecca Smith and Trish Schweitzer. Sponsors of the new members are past club president Jo Ann Seaman and club treasurer Larry Twyman. The induction brings the total club membership to 51. November 4, 2012: Stephanie Fox, an eighth-grade student at Ridgeview Junior High, has taken the first couple of steps to becoming an internationally recognized artist by winning a local “Peace Poster” competition sponsored by the Pickerington Lions Club. Fox’s poster was among more than 350,000 entries submitted worldwide in the annual Lions International Peace Poster Contest. Lions Clubs International is sponsoring the program to emphasize the importance of world peace to young people everywhere. The theme of this year’s competition is “Imagine Peace”. Locally, thirty-two students from Ridgeview entered posters that were judged by two Canal Winchester artists, Carolyn Sittler and Linda Sabo, at the Park Alley Banquet Hall in downtown Pickerington on November 1. The Lions Club held a reception there later that same evening in honor of the artists. Fox’s entry also won the next level of competition on November 4 when it was judged against nine other local club winners at the District level. Her poster will now go to the Ohio Lions State level competition to be judged against other District winners from around the state in December. 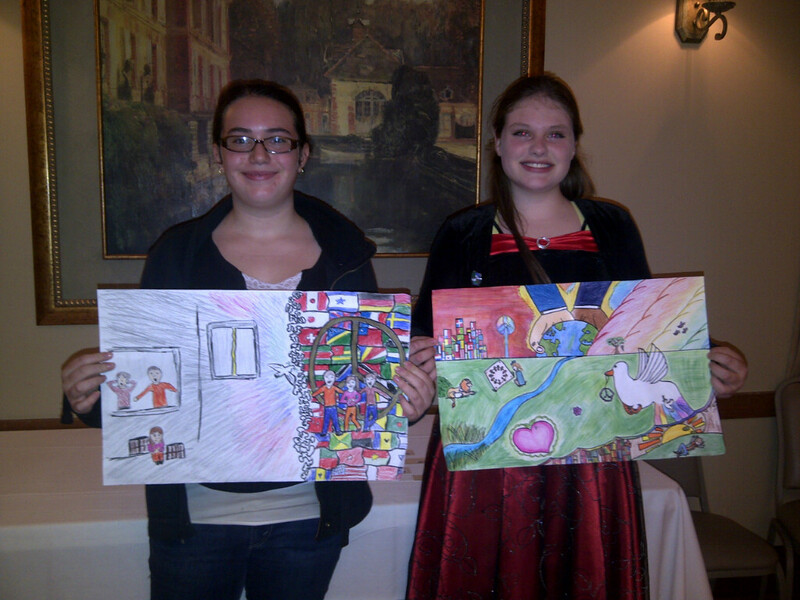 Other winners of the local Pickerington contest were: Jayson Dzurilla (2nd place) and Keely Stagg (3rd place). The top three artists received monetary prizes. All students received certificates and the official pin of the Pickerington Lions Club. The Pickerington Lions Club was once again a “Main Sponsor” of the Big Brothers / Big Sisters “Bowl for Kids’ Sake” fund-raiser at Rule (3) on May 5-6. This was the third year in a row for the club's support of this event. As a main sponsor, our club name was prominently displayed at Rule (3), our logo was on event T-shirts and our club business cards and pens were in the bowlers’ ‘goody bags’. We also had a Lions Team made up of Lions Larry & Cathy Twyman and Bernie & Jim Hatem (pictured above) bowling on Saturday, May 5. Lion Larry distinguished himself by winning the High Mens honors with a 179 game. The Pickerington Lions Club was named Club of the Year at the annual Lions District 13K Convention held in Marietta March 2-4. The club won the distinction in the 36-50 member category. 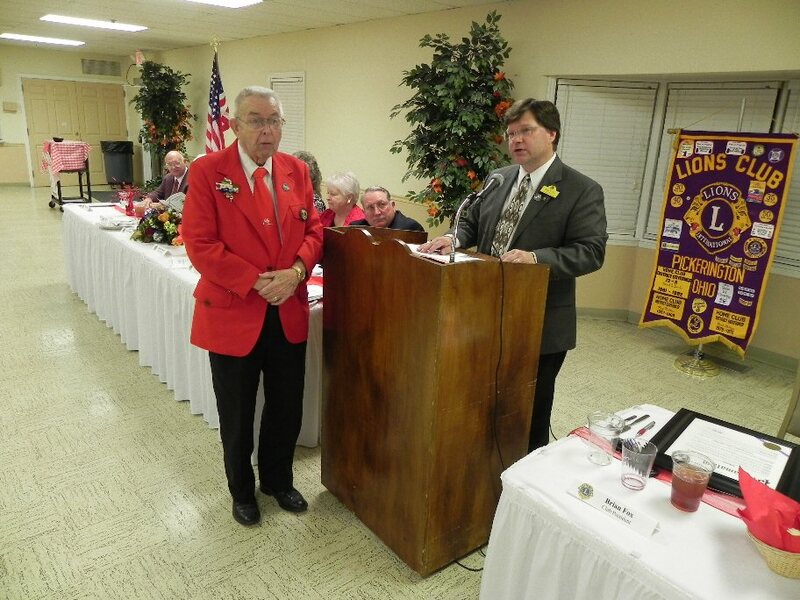 District 13K includes 53 Lions Clubs in ten counties, including Fairfield. “Our club members have worked very hard this year to serve our community and raise money for those in need,” said Brian Fox, president of the Pickerington Lions. “I’m so happy that our hard work has been recognized with this award,” he added. To win the award, a variety of criteria was reviewed including the club’s local service activities, fund-raisers, eyeglass and eye exam purchases, charitable donations, used eyeglass collecting, as well as participation in District Lions meetings, seminars and events. The Pickerington club also received the District Humanitarian Award which is based upon the club’s donations over the past eight months totaling over $10,000 to many individuals and charitable organizations. Additionally, the club received the District Service Award in recognition of the many service projects performed by the club in the last year. Fox and club secretary Bob Mauger were also honored at the convention with the Excellent President Award and Excellent Secretary Award, respectively. In order to be so honored, they had to fulfill a variety of requirements set out by the Lions District Governor. Pickerington, Ohio, December 6, 2011 - The Pickerington Lions Club recently donated a large, table-top magnifying reader to the Pickfair Square Apartment complex located on Jericho Road next to the post office. The reader was donated to the Lions Club months ago by a local woman whose husband no longer had use for it. She gave it to the club because she thought the Lions would be able to find someone who needed it. 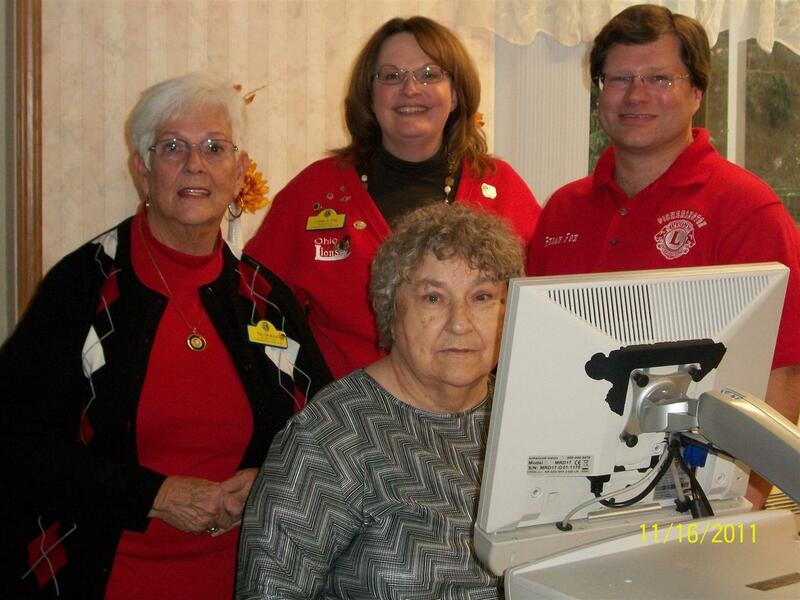 At Pickfair Square, the main user of the reader will be Mary Johnson, who told Lions Club members when the reader was set up that she hasn’t been able to read anything in years because of very poor eyesight. She now enjoys reading newspapers and her old recipes again. presenting it to Lion Tom Brubaker. The Pickerington Lions Club celebrated its 65th anniversary at the Pickerington Senior Center on November 5. The event began at 6:30 PM with a social time for members and guests, featuring appetizers, punch and wine. The program began at 7:00 PM with dinner following shortly afterward. Dinner included salad, roast pork tenderloin, lasagna, mashed potatoes, vegetables and birthday cake. The guest speaker was Jackie Christensen, president of the Canal Winchester Lions Club, who presented and commented on Helen Keller’s famous 1925 speech to the Lions International Convention in Cedar Point, Ohio, in which she asked Lions to adopt the cause of the blind. Also in attendance was Mitch O'Brien, Mayor of Pickerington, who presented the Lions with a mayoral proclamation congratulating the Lions on 65 years. Sixty-nine Lions from around District 13K attended. All guests received a special, limited-edition Lions collector pin commemorating the club's anniversary. One of the highlights of the evening was the presentation of the Distinguished Service Award to 56-year Lion Tom Brubaker. A very well-deserved award. The Pickerington Lions Club hosted its first Peace Poster Contest in years this year at Ridgeview Junior High School. Fifty-seven students of Cheryl Knox's art classes participated in the contest. Their posters were among more than 350,000 entries submitted worldwide in the annual Lions International Peace Poster Contest. Lions Club's International is sponsoring the program to emphasize the importance of world peace to young people everywhere. Canal Winchester artist Carolyn Sittler judged all entries. Seventh-grader Sienna Float was the winning artist in the Pickerington Competition. The three runners up included: Ozian Fereja, Kayla Stanley and Samantha Lassahn. Awards were given out to winners and participants at a reception held by the Lions in honor of the students' entries. Pickerington, Ohio, May 27: Who makes the best pizza in Pickerington? Members of the Pickerington Lions Club set out to find an answer to that question at its Tenth Annual Pizza Challenge held on May 26 at the Pickerington Senior Center. Seven shops accepted the club's invitation, including Kingy's, Catalfino’s, Romeo’s, Classics Pizza, Creno’s, Pizza Hut, Uno’s Pizzeria. The Challenge was divided into two categories: a "Judges' Choice" and the "Lions' Choice". The challenge was a "blind" taste test, meaning that no one knew what pizzas they were judging. Romeo’s (People’s Choice for Best Pepperoni Pizza). Romeo’s (2nd Place Best Specialty Pizza). "We really appreciate the community spirit of the shops that were involved," said club president Brian Fox. “The real winners of this event are the blind and sight-impaired who will be helped by the money raised at the challenge," Fox added. The celebrity judges included Mayor Mitch O’Brien, Boy Scout Troop 256 scoutmaster Jerry Pritchard, Kiwanis representative Mike Sabatino, GOOD Program founder Ron Derry and his wife Pam, also of the GOOD Program. Pickerington, Ohio, May 12: The Pickerington Lions Club is searching for the best pizza in Pickerington. In order to find it, the club is inviting all pizza shops in the Pickerington area to enter its tenth annual Pizza Challenge on May 26 at the Pickerington Senior Center, beginning at 7 pm. The public is invited to vote for their favorite pizza. At this time, the following shops have agreed to participate: Kingy’s, Catalfino’s, Romeo’s, Hungry Howies, Classic Pizza, Uno’s, Pizza Hut and Creno’s. Other shops are expected to enter. "This is a great event," said Club President Brian Fox. "It's always a lot of fun and it will help the club raise money needed for our sight-saving efforts. We really appreciate the community spirit of the participating shops," Fox added. The Challenge has two categories: a "Lions’ Choice" and the "Judges’ Choice". The first category will be made up of members of the public who will give First Place plaques for Best Overall Pizza, Best Sauce and Best Crust. In the second category, a panel of local pizza experts will taste test each pizza and also award honors for the three areas mentioned above plus a fourth category of Best Specialty Pizza. The challenge will be a "blind" taste test, meaning that no one will know what pizzas they are judging. The celebrity judges will include Mayor Mitch O’Brien, Boy Scout Troop 256 scoutmaster Jerry Pritchard, Kiwanis representative Mike Sabatino, GOOD Program founder Ron Derry and his wife Pam. This event is open to the public. However, the capacity limit for the number of people allowed in the Senior Center is about 250, so doors will close when that number is reached. Cost is $4 per person at the door. Pizza shops interested in entering the challenge should call 833-4728. The members of the Pickerington Lions Club will hold their annual Open House on April 14th at the Pickerington Senior Center, 150 Hereford Drive. Refreshments will be served at 6:30 PM and the program will begin at 7 PM. Meet our new mascot, Roary! If you are looking for a way to give back to the community or lend a helping hand, please consider joining the Pickerington Lions Club. In keeping with the Lions Motto "WE SERVE", please bring a non-perishable food item to donate to the Pickerington Food Pantry. For more information, contact club president Brian Fox at 614-619-3977. March 7, 2011: Pickerington Lions Club members Brian and Lilane Fox attended the recent Lions District 13K Convention in Lancaster, March 4-6. The Pickerington Lions Club received many awards during the event, including the coveted Humanitarian Award which is presented to clubs that donate to a variety of charitable, civic and medical organizations which are supported by the Ohio Lions. To be eligible for the award, the Pickerington Lions made donations over the past six months totaling over $8,000 to many individuals and organizations, including: local citizens for eyeglasses and exams, Central Ohio Lions Eye Bank, Ohio Lions Pilot Dogs, Diabetes Association, Ohio Lions Foundation, Eye Research Foundation, Camp Echoing Hills, the GOOD Program for the Pickerington Schools, local needy families at Thanksgiving & Christmas and others. "The Lions motto is 'We Serve,'" said club president Brian Fox. "We know that the money we give to our targeted organizations will go a long way toward serving people in need," he added. The club also won the District Service Award which is based upon the number of service projects the club is involved with. Additionally, club secretary Bob Mauger was honored by receiving the Excellent Secretary Award. The club also received the Best Newsletter Award. January 3, 2011: Once again the Pickerington Lions Club “adopted” a Fairfield County family in need, helping to provide them a Merry Christmas and some financial relief. Our family this year included a mom and dad and four (going on five) sons. The family experienced a fire last year, losing most of their belongings. Donations this year conservatively topped $2,000 in value. This included approximately $400 of groceries and household products (laundry soap, toilet paper, cleaning supplies, etc). The family had requested food and household products, and one unusual donation was a sealed smoke & fire detector with a 10-year battery. The boys each received several items of clothing and shoes (including some lovely baby clothes for the newest member of the family), and at least three “fun” surprises, including new bicycles for the older boys and riding toys for the youngest, science kits and magic tricks, games, Hot Wheels cars, family DVDs, and lots of stocking stuffers. The family also received $150 in a gift card to purchase groceries and other items as needed. In addition, the Lions Club gave seven $50 gift cards to the Child Protective Services for their discretionary use. This was a major project for our club with over half the members helping out. 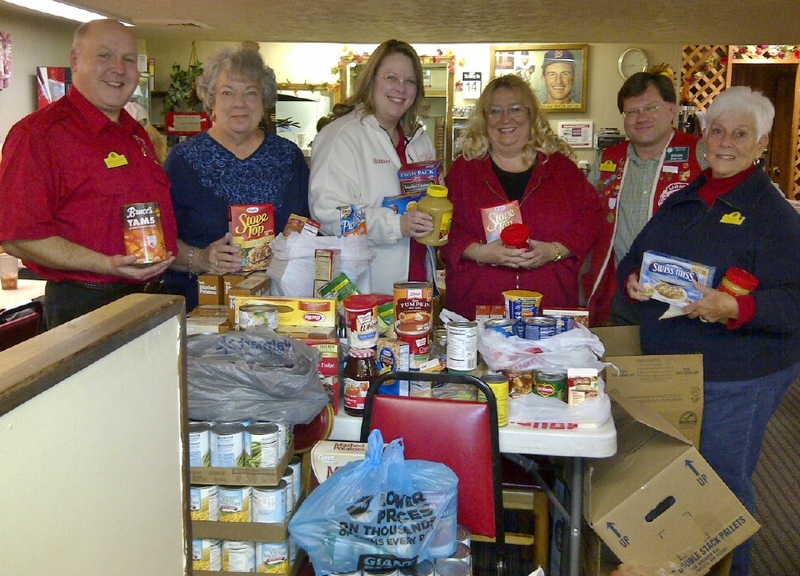 November 19, 2010: The members of the Pickerington Lions Club recently collected over 260 food items in order to create 3 large food baskets for three needy families at Thanksgiving. Each basket contained a variety of canned, boxed and non-perishable food items for a complete Thanksgiving Day meal as well as other meals. The club also supplied each basket with a $50 gift card for the families' use. The families were suggested to the club by Fairfield County Jobs & Family Services. APRIL 22: Who makes the best pizza in Pickerington? Members of the Pickerington Lions Club set out to find an answer to that question at its Ninth Annual Pizza Challenge held on April 22, 2010, at the PickeringtonSeniorCenter. Ten shops accepted the club's invitation, including Kingy's, Hungry Howie’s, Catalfino’s, Romeo’s, Classics Pizza, Taranto’s, Pizza Hut, Grapevine, Pizza Cottage and Eddie’s Pizza & Deli. "We really appreciate the community spirit of the shops that were involved," said club president Jo Ann Seaman. "The real winners of this event are the blind and sight-impaired who will be helped by the money raised at the challenge," Seaman added. The judges for the Pizza Challenge were: County Commissioner Mike Kiger, Pickerington Chamber of Commerce President Helen Mayle, CW Chamber of Commerce President Kim Rankin, Violet Township Fire Chief John Eisel and Kiwanis Club Representative Mike Sabatino. MAY 12: The Pickerington Lions Club has donated over $8,000 over the last 12 months to the charitable and civic causes it supports. The club thanks the Pickerington Community for its support and generosity. The Pickerington Lions Club will hold a “Membership Open House” on May 27, beginning at 6:30 PM at the Pickerington Senior Center, 150 Hereford Drive. Desserts, coffee and other beverages will be served. The public is invited and there is no cost to attend. The purpose of the event is to inform & educate the public about what the Lions Club is and what it does for the community and beyond. Refreshments will be served beginning at 6:30. A short program will begin at 7 pm. There will be two or three speakers from various organizations to briefly discuss how Lions have helped make a positive difference in the lives of those less fortunate. Other informational materials will also be available. For more information on the Open House, call Brian or Lilane Fox at 614-833-4728.